Type I membranoproliferative glomerulonephritis may present with hyperlipidemia, proteinuria, edema and hypoalbuminemia ( nephrotic syndrome). Type I membranoproliferative glomerulonephritis may be treated with antiplatelet drugs and corticosteroid. Type I membranoproliferative glomerulonephritis may present with expansion of the mesangial matrix into the capillary loop /tram track appearance and reduplication of the basement membrane. There will be electron dense deposition on the subendothelium. The common cause of type I membranoproliferative glomerulonephritis are hepatitis B, hepatitis C and SLE. 1.Gans, Reinold O., and Leonard G. Feld. "Membranoproliferative Glomerulonephritis Type 1." New England Journal of Medicine 334.6 (1996): 367-367. 2.Appel, Gerald B., et al. 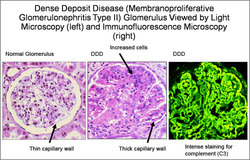 "Membranoproliferative glomerulonephritis type II (dense deposit disease): an update." Journal of the American Society of Nephrology 16.5 (2005): 1392-1403.